Work, School and Babies….. head spinning yet? Poor hubby has been at work all weekend. He works nights and for some reason they had him come in at 7am yesterday and he wasn’t able to come home until 11pm. Saturday is really the only day we get off at the same time, so it was really disappointing when he got called in to work. I hate when squadrons leave for training. They always wait until last minute to fix their plane and so random people have to work until it is fixed. Right now my hubby is working with the tools so he’s been there to make sure they have all the tools they need. It wouldn’t be so bad, but after he got home last night, they informed him that he would need to be back in the morning at 8am. At least he got one extra hour of sleep, but it’s still early for a night worker. That also threw off our family schedule. My school was offering a trail run of State Board licensing tests today. I had planned to go in, but since hubby had to work, I had nobody to watch Mr. Blue Eyes. I talked to BIL but he has work today and we talked to our normal babysitter, but they already had plans out of town. I don’t feel like I will fail if I don’t go, but it would have been nice to have the extra practice. Especially since she’s not the best teacher in the world and I haven’t even seen the second half of what’s expected yet. On the plus side, I’m down to roughly 70 hours before I graduate. I thought I’d never get here. My hubby’s school isn’t going so bad either. Unfortunately since he can’t access school from his work we’ve been playing the email game. He emails me the discussion or homework and I have to log in and post it so that the paper isn’t late. It’s not so bad, but I get a little confused maneuvering around his school’s website. Thank goodness he was able to walk me through it on the phone. This set of classes will be done in two weeks! We sat down and figured it out the other day, he needs 10 classes to graduate, only 4 in his actual degree of choice, and the rest upper levels. So he went through the website and found every class that was required, and every one he thought he’d be interested in. Now he just has to pick one off his list and keep going. He decided to only take one class next set of classes because we will be due with our little girl! But the set after that will be full force. He should have his degree by the end of next year! I’m down to less than 60 days for our little girl! I’m not as big as I was with Blue Eyes, but I feel this one more. I still get morning sickness from time to time and my migraines have not let up at all. I’m really getting tired of going to the doctors. Last time I was there, I ended up being there from 9am to 2pm. That’s a long day to sit and do absolutely nothing. If I’d known I was going to be there that long, I would have brought study material or crocheting to do. In the end, they were able to dull down my migraine and I found out that Little Miss is really active and I am having contractions, I just can’t feel them yet. That’s good news right? I’m getting ready, but it’s not painful yet. I’m so grateful my sis sent down her little one’s hand-me-downs. I’m not worried about what we will put on her anymore! Blue Eyes on the other hand is growing faster than a weed. He went from 12 months to 18 months almost overnight! Not only that, but I noticed his 18months clothes that we just got are sitting a little snug. He’s still as skinny as can be, but he’s getting really tall. In other news, we have some time before the first of our visitors arrives. Hubby’s best friend is coming down for a short visit next month. It will be a nice break for hubby. I’m hoping it will help him relax before the chaos of a new little one and the jealousy of a certain Blue Eyes. I know the hardest part is the first couple months but I really hope Blue Eyes likes his sister. There are a few things I know I will have to get two of. I’m sure he is not going to share his blankies. He is really funny about them. He recently claimed one of mine, and if I so much as hold it, he melts down. We have to sneak wash them, so I’m sure we will be getting a couple ‘specifically baby girl’ blankies. Another thing we will eventually need two of is rocking horses. Blue Eyes is not fond of sharing his. It’s a giraffe and I have to admit it’s awesome. So instead of fighting about it, we were thinking about getting a little elephant one so that we have two different animals. But that’s all easy stuff. I’m so glad he’s a fairly happy baby. 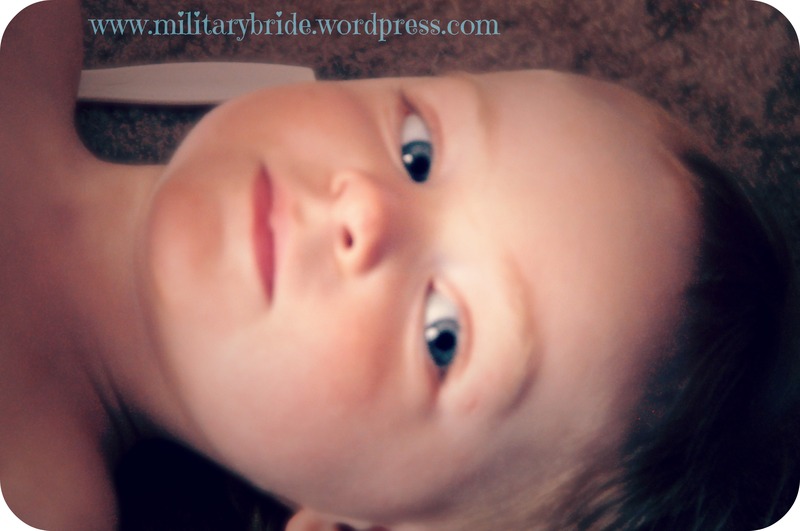 Posted in Baby, blogging, boys, family, life, military family, motherhood, school, Uncategorized and tagged aviation, babies, baby, baby boy, baby girl, family, life, military, military family, motherhood, photography, school, son. Bookmark the permalink.